Montessori Sensorial Materials for My Six-Year-Old? My son went to Montessori preschool for about a year...The kids were spending way too much time in language arts and not enough time in sensorial. At any rate, I asked my son to point to me all the sensorial exercises he did, and he seemed to have missed a few such as the Brown Stairs and Red Rods, Binomial Cube, etc. Do you think we should go back and redo some of that? He will be six years old in May, and I am not sure if those Montessori sensorial exercises will help, and at the same time, we will continue to use the Montessori method with him at home, and I want to make sure we follow it appropriately so there are no gaps. It is (also) true that more and more children don't show an interest in the Montessori Sensorial materials, and it is up to the teachers to make it fun, and not just rely on the standard Montessori lesson. You have to reinvent the wheel, so to speak! As for your six-year-old son, instead of buying Sensorial materials he has outgrown and would not repeat (like the Brown Stairs and Red Rods), I would get other age-appropriate Sensorial materials: the Trinomial Cube (not the Binomial Cube--too easy); the colored Trinomial Cube; the Knobless Cylinders --not to be used as stacking like the Pink Tower nor matching to cards (and you can skip the blue ones); the Geometric Cabinet (very expensive and you would need the cards that go with it--also a great pre-reading material); Color Box (Tablets) Three ; and maybe the Baric Tablets. This is how you present the Knobless Cylinders, by the way. As for needing to go back and fill in gaps, I wouldn't worry about that unless your child has developmental delays. 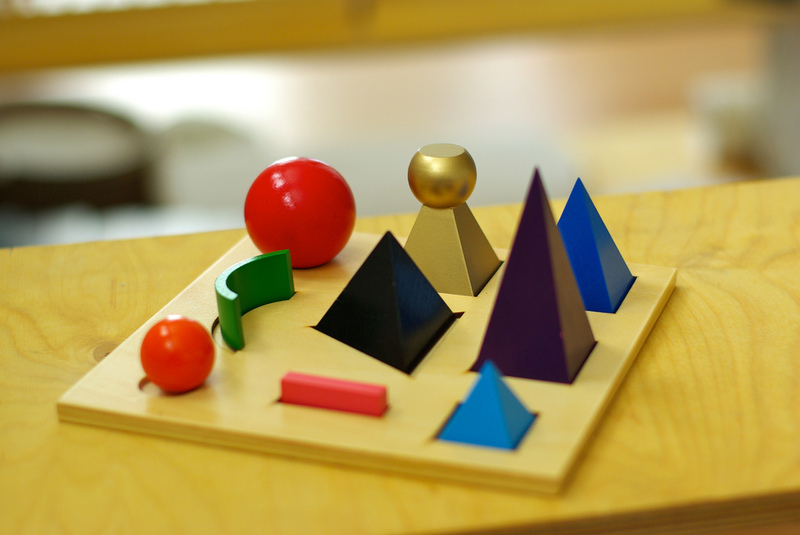 "The Montessori Sensorial apparatus is designed to make the child aware and to refine his senses. The senses put man in touch with his environment, his group and his time. They put him in touch with his world. The sense organs are completely formed at birth, but the ability to use them has to be built up gradually in man. The senses take in impressions, which are passed on to the mind, which then passes them on to the subconscious to be absorbed and classified. Each and every impression received furthers and builds the development and the evolving of man. The more highly developed the senses become, the more impressions they take in. The more impressions that are taken in, the more food they bring to the mind, and thus the broader the base of the mind. Also, the more impression brought in, the more curiosity is aroused and the wider the field of interests becomes. The sensorial apparatus has its purpose precisely in this field. It helps the child to refine and elevate his senses through interesting and challenging activities. The apparatus is so created as not only to develop the senses, but also to classify the impressions received in accordance with the child's need for order."